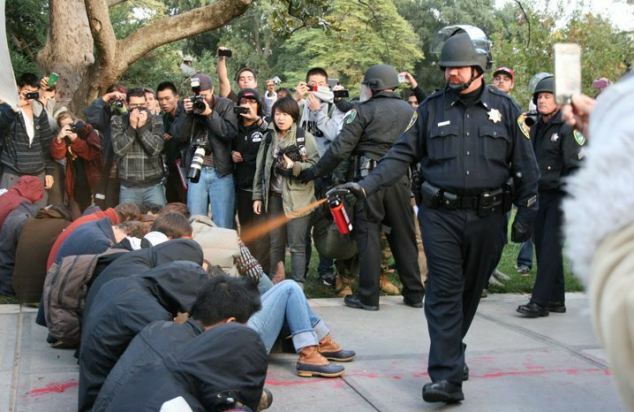 Anyone who watched the video of this robot cop blithely spraying a group of college students when they were peacefully protesting could see that this was an excessive use of force and it was completely and utterly unecessary. Many people don’t realize that that was the least of what happened at UC Davis. Since this incident, the UC Davis police chief and both officers were put on administrative leave and the Chancellor, who authorized the police action, has been under pressure to tender her resignation as well. Yes – that’s the way things seem to roll. The Bush cabal was not held responsible for war crimes, corrupt bankers were not held responsible for bringing down the world economy and Linda Katehi isn’t responsible for ordering riot police to disband a group of students who were peacefully demonstrating on the UC Davis campus. By the way, here’s Linda Katehi’s walk of shame on Saturday. As she left her office, students lined the three blocks between her office and her car and sat in silence as she walked through this very still and unmoving corridor of people. It was very powerful indeed. I’d like to see everyone involved in this unprovoked brutality pepper sprayed and arrested, after having their faces ground into the sidewalk. Let them experience what it is like to be assaulted simply for exercising the right to assemble. They haven’t revoked the first amendment yet, have they? Alan, I realize now that my post really wasn’t about the militarization of the police but a rant about the Chancellor… however, you are so right. The police are the hired hands for our corporate and political overlords. I’m going to re-read Animal Farm, as a matter of fact. And Debbie… I just knew this story would make you as angry as it has made me. Let me tell you… AP watched some of the videos of the police brutality going on in Oakland and he burst into tears. And I also became very emotional when I saw those kids getting pepper sprayed and all they did was just crumble into each other, silently, while the crowd looked on in horror. If that (fat slug) policeman was your Daddy how proud would you be? How proud can he be, to go home to his family after doing that? Extend that to the nation as family and ask how proud the President can be.